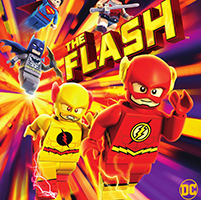 The popular Lego DC Super Heroes film series has captured the imagination of kids the world over. The Paley Center proudly joins our friends at Warner Bros. Home Entertainment in presenting a fun-filled family-friendly screening celebration that will include the world premiere of Lego DC Super Heroes: The Flash; photo opportunities with Lego DC Super Heroes standees; an autograph signing on free collectible posters by the actors and filmmakers in attendance, including the voices of The Flash, Wonder Woman, and Firestorm; and Lego toy giveaways for everyone in attendance while supplies last. The event is free and open to the public. Please RSVP to attend. Paley Members will be admitted to the theater first. Become a Member: Join us online or contact Membership at 310.786.1066.